With all the hype about the social media buzzing around, Jasper Raft Tours is finally con­nected and wants you to fol­low us! 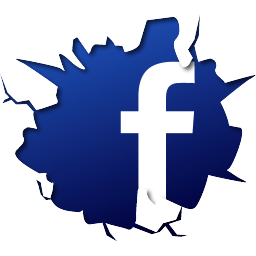 Here are our Face­book and Twit­ter URL’s. Drop us a tweet or com­ment on our face­book on what you would like to see in our content. This entry was posted in Featured and tagged jasper raft tours, social media on November 20, 2013 by Eddie Wong. 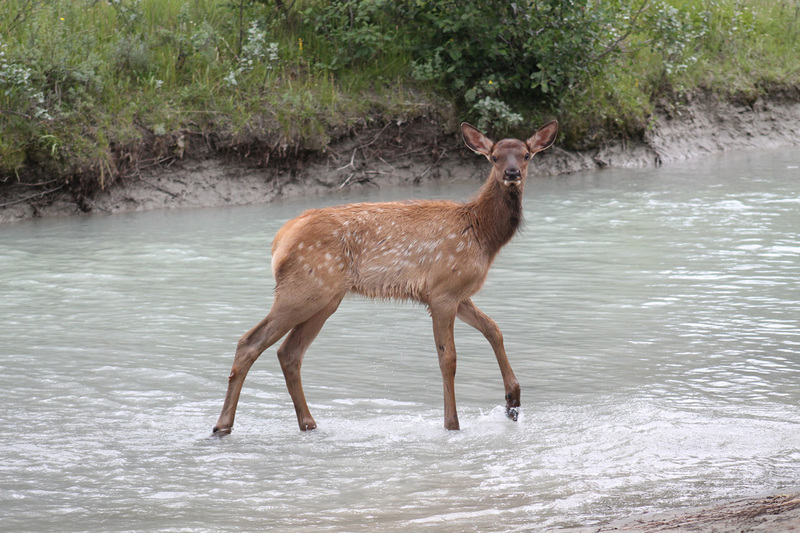 Caught these Elks at our land­ing of the rafts swim­ming across the Athabasca river. This entry was posted in Photo Gallery and tagged elks, float trips, jasper national park, rafting on July 29, 2013 by Eddie Wong. Michael Har­ris got it right when he com­pared Jasper’s night skies to Van Gogh’s Starry Nights. 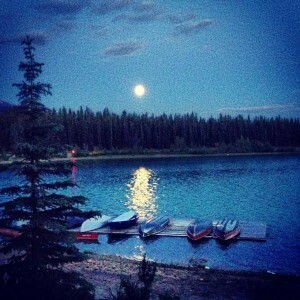 I June Moon over Patri­cia Lake took this photo in late June. It was almost mid­night yet still bright out. You sure do get your money’s worth when you vaca­tion in Jasper. Every day is like almost 2 days any­where else with all the day­light this beau­ti­ful North­ern Rock­ies park enjoys. In the sum­mer, you have to be pretty patient, wait­ing for the dark skies to arrive. But, when they do, the show is amazing. If you’re lucky enough to own an iPad, be sure to install GoSky­Watch Plan­e­tar­ium for iPad — the astron­omy star guide. It’s an incred­i­ble teach­ing tool for zoom­ing in on & iden­ti­fy­ing constellations. This entry was posted in Featured, Jasper National Park Activities, Jasper National Park Info, Photo Gallery, Travel Alberta and tagged #raftjasper, jasper family activities, jasper family adventures, jasper family tours, jasper national park, jasper skies, night sky on July 24, 2013 by tagdesigner. What is it about rain­bows that makes peo­ple stop in their tracks? One thing is for sure, top off a raft trip with a rain­bow at the very end and you’ll know you’re sure not in Kansas anymore! This entry was posted in Featured, Photo Gallery, Travel Alberta and tagged #raftjasper, 2013 rafting season, alberta icefields parkway, jasper family activities, jasper family adventures, jasper raft tours, jasper skies, photography, rafting in jasper, rainbow on July 24, 2013 by tagdesigner. Talk to any­one about this and they’ll agree: Men are the tough­est peo­ple to buy gifts for. Even men will agree. What a lot of men will admit is that when they want some­thing, they go ahead and buy it. So it’s tough to look for the per­fect thing that never in his wildest dreams did your dad think he would like. So is it any won­der that, with 3 weeks to go, I’ve already heard rum­blings, stress­ing & anx­i­ety about what would be the per­fect gift for that spe­cial guy. 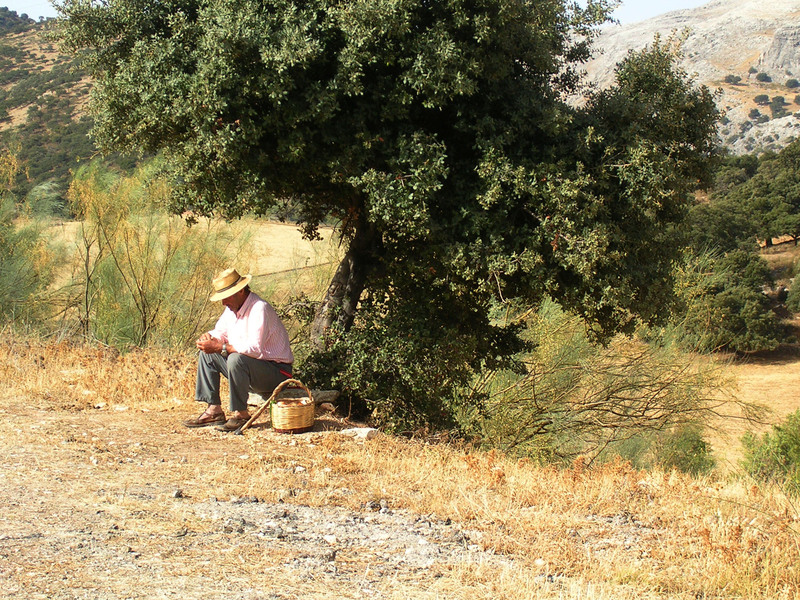 I thought I could find good hints by look­ing up the top bucket lists for men. I’m not sure that look­ing through bucket lists helped clar­ify Father’s Day plans but it sure did show men’s wishes in all of their var­ied and com­pli­cated forms. No. 12: Leave your­self a let­ter in a library book. Look for it twenty years later. Pick an obscure biog­ra­phy in a col­lege library, since no one there wants to insult obscu­rity by decat­a­loging a book, and the library will most likely always be there. One page. Be dis­creet. Type it on erasable bond, tuck it in the back, and hope that no one ever notices. As for con­tent, skip the hopes and dreams. Men­tion the weather, tell your­self what you ate that morn­ing, make a list of your friends, note how much you weigh and whether you feel fat, remind your­self of a secret you want to keep. I’m not sure how many men would actu­ally try this lit­tle note idea. Plus how do you give that to dad for Father’s Day? Other wishes that men listed had a com­mon theme: out­door adven­tures. Some guys wanted to fly air­planes, some wanted to sky-dive and oth­ers wanted to go on all-men camp­ing trips, watch the sun­rise and sun­set all in the same day, drive the Cal­i­for­nia Coast Highway. Another com­mon theme was that men wanted to express gen­eros­ity or kind­ness in some way. There was a sort of sweet­ness to this theme: to do a truly phil­an­thropic act, pay the toll for the car behind him, walk his daugh­ter down the aisle, see a baby being born. So, instead of wast­ing time tear­ing through malls to find the per­fect “stuff” to wrap for dad this Father’s Day, how about plan­ning a great expe­ri­ence … like raft­ing, for example? 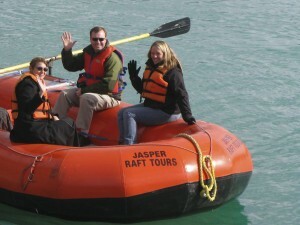 The best thing about a raft trip with Jasper Raft Tours is that ours is a “Class 2″ trip. That means the river is gen­er­ally tame with a few fun areas where you could get splashed so it’s suit­able for all ages. Our expe­ri­enced guides can make the day fun & mem­o­rable for the entire fam­ily. We even take expert pho­tos for you to give dad as a keepsake. If dad prefers, make it an all-guy event: book a trip for dad and his friends. Father’s Day is less than 3 weeks away so book your trip now & make sure you also book a din­ner reser­va­tion at one of our great restau­rants. It’s likely the restau­rants are going to be pretty busy on Father’s Day & I’m sure you don’t want to be disappointed. Choose to make this Father’s Day an entire day of mean­ing­ful, fun-filled memories. This entry was posted in Jasper National Park Activities, Travel Alberta and tagged father's day, men's bucket list on May 27, 2013 by tagdesigner.